"Queensbury station" redirects here. For the former station in West Yorkshire, see Queensbury railway station. Queensbury is a London Underground station in Queensbury, London. It is on the Jubilee line, between Canons Park and Kingsbury, and in Travelcard Zone 4. The station opened on 16 December 1934, two years after the neighbouring stations, as part of the Metropolitan line and with its branch was transferred to the Bakerloo line in 1939, and then the Jubilee line in 1979. The name Queensbury did not, when it was chosen, refer to any pre-existing area. It was coined by analogy with the adjacent Kingsbury station. 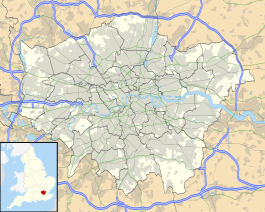 Most of the locale now known as Queensbury is actually to the north-west of the tube station, in the London Borough of Harrow, just across the borough border from the tube station, which is in the London Borough of Brent. London Buses routes 79, 114, 288 and 324, night route N98 and non-TFL routes 614 and 644 serve the station. Since 2013 and together with Canons Park station, Queensbury station is the next Tube station for "The Hive Stadium", the new football ground of Barnet FC, that is located 400 metres north along the railroad tracks. The station, and its local surroundings and characters were cited in the song "Queensbury Station" by the Berlin-based punk-jazz band The Magoo Brothers on their album "Beyond Believable", released on the Bouncing Corporation label in 1988. The song was written by Paul Bonin and Melanie Hickford, who both grew up and lived in the area. Wikimedia Commons has media related to Queensbury tube station. This page was last edited on 25 February 2019, at 17:03 (UTC).